In the present competitive scenario, modern organizations are faced with several challenges from the external environment which are political, social and economic in nature. Along with the pressures of such factors, the organizations have to compete by coping up with the challenges posed due to globalization, technological innovation, changes in the preferences/lifestyle changes, acute skill shortage and workforce issues, financial forces and also changes in the legislations internationally. According to Macredi and Sandom, 1999, the ability to successfully manage change has become a vital asset for the organizations in the present scenario for staying competitive in the unstable environment. Transformational change means alterations in certain areas which is caused due to an interaction with the environmental factors and creates a need for new behaviours or changes in the behaviours of the organizational employees. 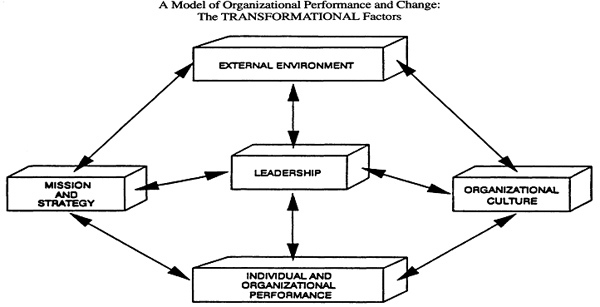 According to Jick and Peiperl (2003:218), a transformation is referred to as organizational reorientation. Cummings and Worley (2001:498) and Grobler (in Verwey & Du Plooy-Cilliers, 2003:192), viewed transformational change as paradigm modifications both at the individual and organizational levels. They equally viewed transformational change as the major task of the leaders of the present scenario, from which emanates the term transformational leaders. External Environment: It constitutes the external factors or situations that influence the organizational performance like the worldwide economy, politica/government factors and the legislations. Mission and Strategy: Mission is the reason for existence of the organization and strategy constitutes the road map of action and how the organization achieves its goals/purpose over a period of time. A written mission statement guides the employees in their pursuit of organizational excellence. Leadership: Leaders provide direction and guidance to the employees for behaving and performing in expected ways. Organizational Culture: Culture of an organization influence the behaviour of the employees and the way the employees do things. Structure: Structure describes the hierarchical pattern in an organization, levels of responsibility and the arrangement of functions, authority for making decisions, communication patterns and relationship for ensuring effective implementation of the organizational strategy and realization of goals. Ensuring the commitment of the senior management towards the change, which should even be visible to all the organizational members. Producing a written mission statement and the futuristic vision/direction of the organization which may provide guidance on the objectives, policies and values. Building a shared awareness and change in the perception of the employees regarding the need for change. Selecting a team of key managers and opinion formers who will be playing a crucial role in gaining the commitment of the employees towards the change and in disseminating the change widely across the organization. Generating an acceptance towards the overall process of change and the entire process of transformation. Developing an understanding that resistance to change is inevitable and it needs to be managed effectively. Educating and training the participants regarding the necessary competencies required for effectively overcoming the resistance towards the change and winning their commitment. Taking steps for avoiding the blames or any kind of negative behaviour which may generate any kind of resistance towards the change. Using appropriate resources for facilitating this entire process of transformation or change. Maintaining open channels of communication regarding the key processes, failures, challenges and the learning from the new initiatives. In a nutshell, transformational change has been described from different perspectives. According to Head (1997), transformational change refers to change in the structure, culture and key processes of an organization. As per Chapman (2002), transformational change requires changes in the attitude, beliefs and values of the employees. As per Stace and Dunphy (2001), transformational change involves a redefinition of the overall organizations strategies, gaining the employees commitment towards the process of transformation and reorienting the culture of the entire organization. In the view of Nadler and Tushman (1989) transformational change is a time-consuming process and requires comprehensive coordination and complete support from the management for effective outcomes.